Welcome, Vs. System 2PCG fans to the first card preview of the upcoming Great Power story Arc! This Arc will have three 55 card Issues releasing in August, September and October of 2018. They will focus on characters that have and wield great power, as well as those that covet it. 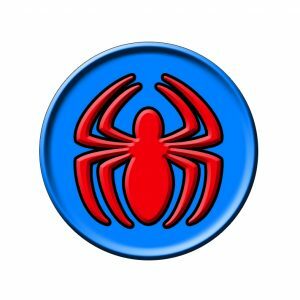 We have a friendly neighborhood preview for you today – featuring the man himself – Spider-Man! 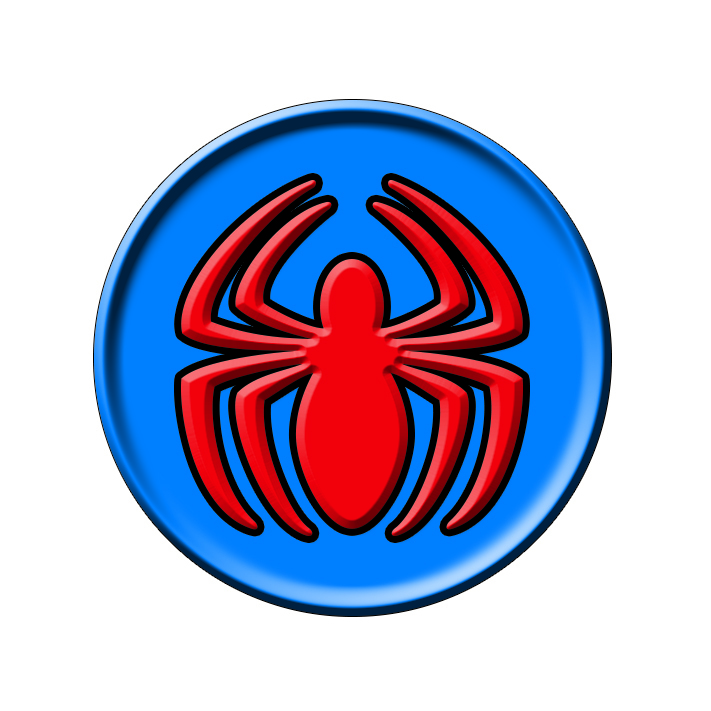 He’s the leader of his own new team – the Spider-Friends ( ). But there are so many stories about Spidey, which one will we showcase? Well, one of our favorite storylines started with a friendly, adorable little alien. When Peter Parker encounters and bonds with a powerful symbiote, it enhances his powers. This is evidenced by his high Level 1 ATK and DEF and 6 health, as well as the positive powers Climb and Symbiosis. 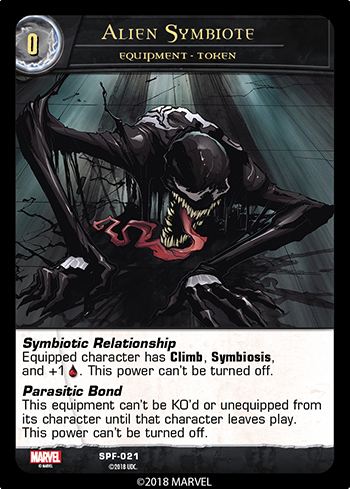 Here’s a quick refresher on Symbiosis, originally seen on Carnage and Venom in the Vs. System® 2PCG®: The Defenders expansion. This keyword allows the character to have and gain +1/+1 counters while it is stunned. Normally, of course, those counters fall off stunned characters. And what is Climb? Spider-Man and many of his friends and foes are great at scaling heights. In the game, this lets them gain the high ground before the fighting starts — at the start of your Main Phase, you may exhaust a location on your side to put a +1/+1 counter on your character with Climb. A character can only climb one location per turn and the same location can’t be climbed by more than one character. So if you have two locations but three climbers, one of them is out of luck. During your Recovery Phase your exhausted locations will ready the same time your characters do. But Peter’s new powers don’t come without a price. As it turns out, the symbiote was a jealous, dangerous partner that hijacked Peter’s body while he was sleeping and wanted to bond with him permanently. Our Spider-Man main character pays that price by getting stunned at the end of each of his turns. So after coming to the realization that he couldn’t keep this relationship going, Peter, with the help of some fantastic friends and a fortuitous church bell, was able to remove and reject the symbiote. The symbiote didn’t take it well. It found a new host, Eddie Brock, and together they combined their hatred of Peter and became…Venom! 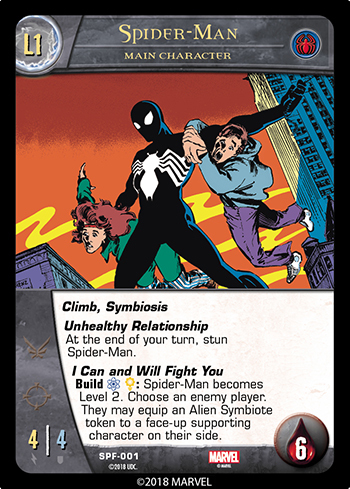 In the game, the symbiote finds a new host as well, giving that character powers and even more health. But it retains its jealousy and can’t be removed from its new host so easily. And what has become of Peter Parker? Note that when he becomes Level 2, he loses a health. Which means that if you don’t get that symbiote off of him fast enough, it will be the death of him. Although he was glad to be rid of the symbiote, Peter liked the look and he wore a similar, less dangerous, black costume for a time. 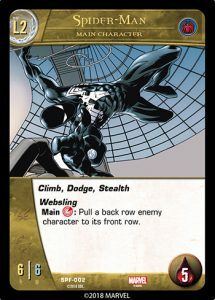 Of course, he could still Climb, and his spider-sense made it easy for him to Dodge, but his new suit also increased his Stealth. And who made that nice new black costume for him? Felicia Hardy, the Black Cat herself. She liked the black and white look, natch. It’s always been hard for Peter to pin down Black Cat’s motivations and agenda! 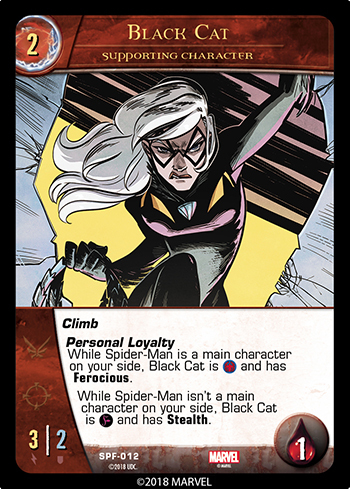 Note that Black Cat has no team affiliation while in a deck, hand or KO pile, only once she appears on your side. Whew, well that was a lot of words for only a few cards – we hope you enjoyed them! Tune in next time when we talk about, well, more Spiders!